American History Lux is a computer strategy game that takes you through the wars that have shaped American History. Have fun replaying the battles, and learn some history while you're at it. Conflicts include the French and Indian War, the American Revolution, the Mexican-American War, the US Civil War, World Wars 1 and 2 (Europe and Pacific for WWII), the Korean War, Vietnam War and finally the Iraq War. Each war comes as a realistic map outlining the important cities and geography of the time. Background information and links to full Wikipedia histories complete your interactive learning experience. 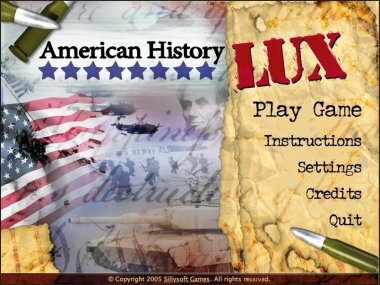 American History Lux is similar in concept to the popular board game Risk, and includes period music and links to learn more about each war. Four levels of difficulty are meant for new prospects and experienced Luxers alike. Without delay, American History is yours to replay! Beautiful graphics and thematic music round out American History Lux. Four varying difficulty provide a good challenge for newcomers and experienced Luxers alike. Beat the game on General level and a special super-hard difficulty will unlock itself.